These top 5 hanging plants have been chosen because they are easy to care for and look great. There is also information on how and where to hang them to help each plant thrive. There are lots of hanging plants available on the market, so you can pick from many to suit your home and personality to create a lovely hanging garden of plants. 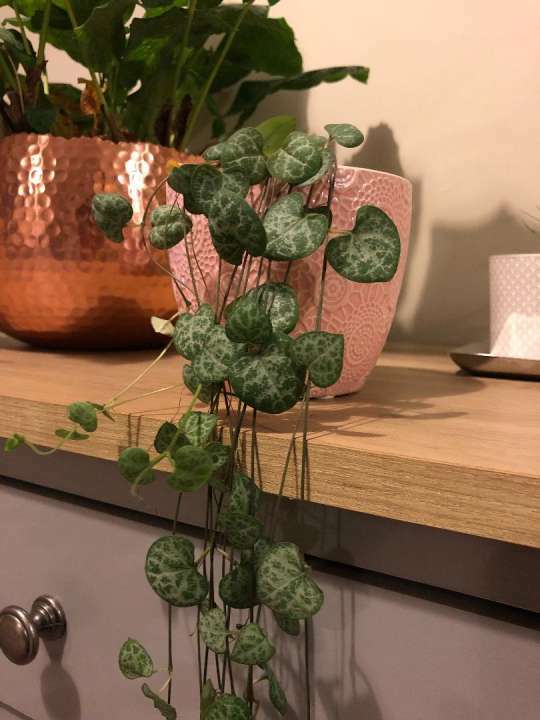 String of hearts is a real showstopper and always look fantastic trailing over a shelf or hanging in a macrame hanger in a suitable size pot. They need bright light and a little early morning or evening sunlight. The light really brings out the colours. Water just a little and protect from draughts. They look great hanging in a Macrame hanger and a lovely pot. These look fantastic in any home, but particularly in a modern, contemporary environment. They love bright light and little water, so definitely only water when the soil has dried out. If you notice the ends of the String of Pearls getting sparse, just trim them off. You may even get to see the little white flowers they produce. Hang them from picture rails or on shelves. Satin Pothos is a superb hanging plant because it's really easy to grow and look after, so great for beginners but also because its leaves have a ‘silvery, satin’ pattern on. They look perfect potted and situated on a shelf where the vines can tumble below. Also great in a hanging basket and will live for a very long time in low light levels and moist soil. These are a perfect way to grow a hanging plant, as Staghorns don't even need soil. They grow on trees and wood and can be grown on just some board. They are great to hang just like you would a picture frame. Try to avoid direct sunlight and let the soil dry out before watering. They will need humidity to supply your Staghorn with a tray of pebbles or hang in a kitchen or bathroom for the steam. A plant that can grow just about anywhere! It needs very little care and similar to other Cacti, only a small amount of water is needed to keep the soil lightly moist and only water in the Winter when the soil gets dry. Fishbone Cactus prefers light (but not too light) and is another plant that likes humidity so playing on a kitchen shelf so it can hang over the edge is perfect. If you are looking for some new hanging plants and pots, please come along and visit us or contact our team.